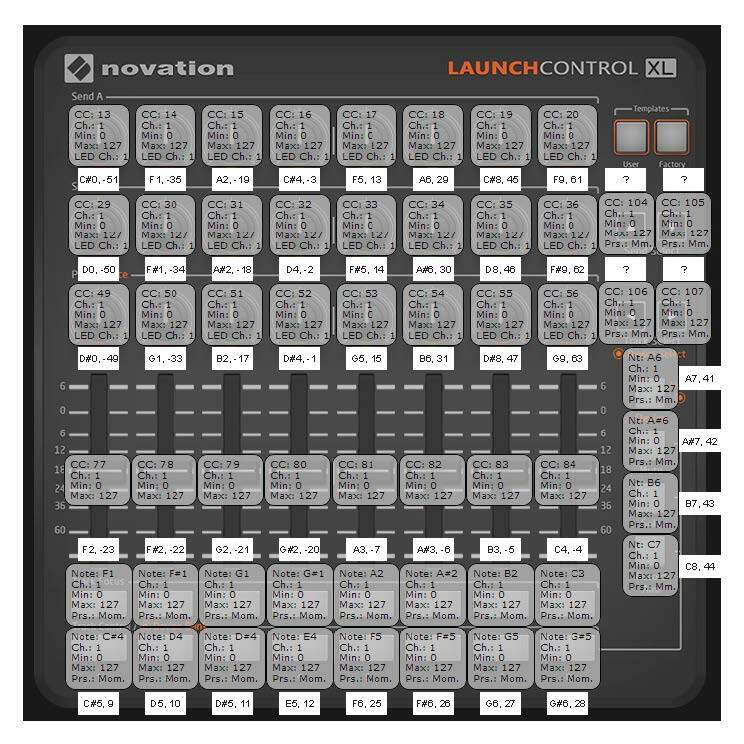 The launchcontrol uses channels 1-8 on user slots 1-8 and channel 9-16 on factory slots 1-8. I made this for the factory slots 1 to make shure we have the same notes and ccs, because user modes can be changed with the editor. I only get the Knob Led to turn off and on, by themselves of by group of 2 or 3 in vertical row. Yes with this object you can controll the lights of the vertical row, the device, mute, solo and rec arm button. the cc part you have to add yourself. When you used my patch the lights of row 7 light up? I tested it on my Lcxl and it worked vor the side buttons. anyway it's ok for now, I have a visual feedback of the switch position for my show in two days. I'm gonna keep it like this. In the mean time I saw this, maybe it would be simple to send a sysex. Where Template is 00h-07h (0-7) for the 8 user templates, and 08h-0Fh (8-15) for the 8 factory templates; Index is the index of the button (see below); and Value is either 00h (0) for off or 7Fh (127) for on. Messages for buttons not set to ‘Toggle’ will be ignored. Multiple buttons can be addressed in a single message by including multiple Index-Value byte pairs. 00-07h (0-7) : Top row of ‘channel’ buttons, left to right 08-0Fh (8-15) : Bottom row of ‘channel’ buttons, left to right 10-13h (16-19) : Buttons Device, Mute, Solo, Record Arm 14-17h (20-23) : Buttons Up, Down, Left, Right"
Though my objects work with factory bank 1 so might not help. I translate the controls to different channels and ccs inside the axoloti and just keep the launch control on the default. Yeah, axoloti is good with midi. I put together a quick patch showing the sort of thing I do to translate. it's got some modded midi input objects that have channel selection added, that can be useful as they aren't affected by the channel selection in the patch settings.